Here are two versions of Classic Boating style for kids. The top one is from Pottery Barn Kids, and the other one is a home made deal. Dang, why not drag in a 12 ft Whirlwind, chuck a mattress in there, put your kids name on the side of it. Make the walls out of strips of wood like a boat house. 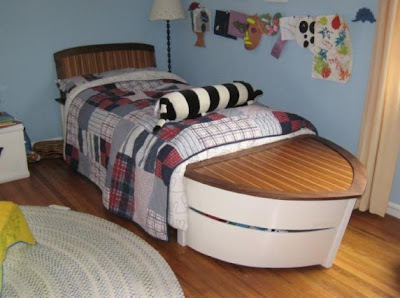 For that matter hang the boat like its on a old lift….make a chest of drawers like a small dock thing , some blue carpet…. then run a round and tastefully splatter some drops of white paint…. yup, simulated bird crap…and you got yourself one cool kids room. Yup, that sums it up! You will have to take the boat out, Paint the room pink, and put of Britney spears posters. Which of course makes me sea sick. But…. oh kids these days. I did a room like this for my kid when he was 4. I painted logs on the wall so it looked like a log cabin, had a cool old iron bed that I wrapped rope around. had pictures of cowboys on the walls, the whole deal. It looked just like a cowboy movie. I had him come in to the room, asked him what he thought…He said. ” Looks like paint” And never went back in, it scared him. I had it painted the next day in batman lime green and purple. He has loved that shade of green ever since. Is it wrong to want one when your 45? My wife can slep on the pull out. No, it’s actually a better idea. Well I usually love having my wife in bed with me so I’ll need one based on a small cruiser hull so I can get enough beam for at least a queen. The heck with the kids, they’ld probably want one shaped like an ipod. Wait, I think normal beds already are. 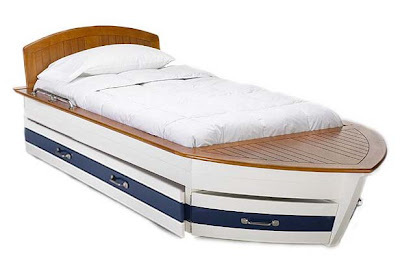 I don’t think those deck seams are correct for that model of bed… Has anyone had a survey done on this bed? Now if it was shaped more like a Vee-Birth and had a head built-in… hummmmm! Well after studying numerous old black and white photos I can assure you that that color blue boot stripe was never used! Joe?…Is that you??? Joe??? Joe??? I think there is a diagram in Dannenberg’s book on how to build a contraption in your garage to turn the mattress over. HA, I am sure there is. I was out this weekend with no computer, I am now reading these. The Joe line still cracks me up. It would be fun to 'rock the boat'….